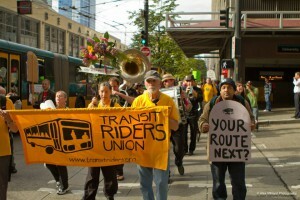 The origin of the Seattle Transit Riders Union dates back to the summer of 2011. Three years into the Great Recession, King County Metro faced a budget crisis due to declining sales tax revenue. Fares had been raised four times since 2008, for an increase of 80%. Now, plans to deeply cut bus service caused a public outcry, and a small group of transit riders who would later found TRU got active in the fight to save our bus service. The King County Council responded to public pressure by voting to stave off bus cuts with a $20 car tab fee. Our bus system was safe for the time being, but we knew the car tab fee was a temporary measure. We also weren’t satisfied with further taxing working and poor people like ourselves. 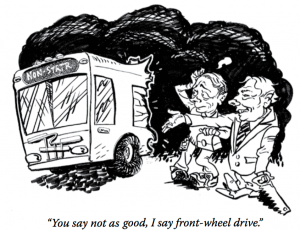 Moreover, with the ecological catastrophe looming, we knew it was imperative not merely to hold back transit cuts, but to push to massively expand public transit in order to reduce dependence on fossil fuels. We saw the need to found a permanent organization to carry on the struggle. We asked ourselves, “Why can’t the politicians – who supposedly represent us – come up with a better solution than giving us the ultimatum: accept cuts to service or a hit to your income?” So we did some studying. It turns out these kinds of cuts are not just the product of the recent recession. Over the past four decades, globalization has decimated the nu mber of decent jobs available to us and replaced them with temporary, low-paid and part-time ones. 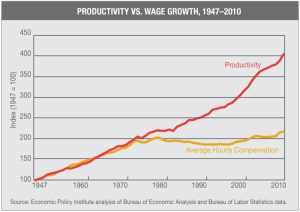 What we lost in wages the financial elite sought to replace with easy consumer credit, thereby consigning increasing numbers of us to debt slavery. In order to further swell their own profit streams, the ruling class proceeded to starve, eviscerate and privatize our social services, and increasingly push the tax burden onto the backs of working and poor people. The result of this onslaught has been that the old “middle class” of decently paid workers is disappearing, giving way to a growing class of unemployed, underemployed and underpaid people, living in a state of precarity with no idea what the future holds. From this perspective, the recent transit crisis made perfect sense to us. It is not just an isolated problem, but one small piece of this decades-long attack on our standard of living. Are we are helpless to stop this? We don’t think so. As corporations concentrate more and more of society’s wealth, they have found the power to put increasing pressure ongovernments and populations in order to get what they want – at the expense of everyone else. Well, they may have the wealth, but we have the numbers. We are many, they are few… and we live here. To counterbalance the pressure that government gets from above, we have to put pressure from below. And to do that, we have to get organized. So with these considerations in mind, in fall of 2011 small group of us drew up a mission statement and ten principles, and founded the Seattle Transit Riders Union. A Union of Transit Riders? We looked back at history for examples of working and poor people successfully organizing and improving their lot, and we saw undeniable similarities between our time and the 1930s, the Great Depression. 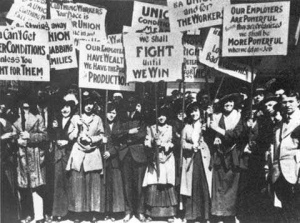 Inequality of wealth was at its highest, and conditions of life for working and poor people had become intolerable. So what did they do about it? They formed unions. And in a few short years, they ushered in a radically new era in American history. The TRU attitude is: we did it before, we can do it again. But a lot has changed since the 1930s. (For instance, most of us don’t work in factories anymore – or live on farms.) 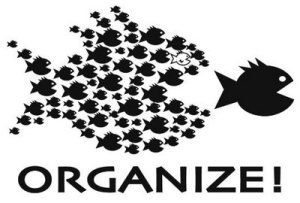 We have to figure out how to get organized in the 21st Century. This is what the Transit Riders Union is all about: developing a new model for organizing working and poor people to fight for our interests, and put people in power who represent us. What have we done so far to accomplish this? In 2012, when we were still a very small organization, we gathered thousands of signatures to protest the closure of the Ride Free Area in Downtown Seattle. On the heels of that campaign, we began to put pressure on the county to adopt a reduced fare for low-income riders. In 2014, we won! The ORCA LIFT program began in March of 2015. In 2014 we threw our weight behind the fight for a $15 minimum wage, and we campaigned to save and expand bus service. In 2015 we assembled a delegation of over 100 transit riders that met with County and City Councilmembers to present our vision of an affordable, reliable, and equitable world-class public transit system. We campaigned in the elections for Seattle City Council, supporting candidates who support our goals and will fight for our interests. And we organized with students and together got the city to dedicate $1 million per year to fund transit passes for low-income high school and middle school students. You can read about more of TRU’s victories and achievements here. Not bad for a young organization – not of trained professionals – but of, by and for poor and working people, running on volunteer labor. In a few short years, we’ve built up the skills and know-how to do things our own way. 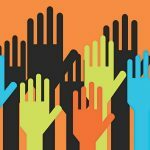 Financially, TRU is supported by our own member dues, and some donations. This makes us independent, not tied to any foundation, labor union or political party. We are democratic and our leaders are elected and accountable to members, who exercise the final say in all matters at our monthly meetings. But effective social movements don’t just spring up out of nowhere. They start with effective organizations like the TRU. By successfully organizing transit riders, we set an example for and give encouragement to those who fight on other issues. We become their allies, and they become ours. So, join with us to take the next step! Become a member of the Transit Riders Union. Let’s get organized and build a movement that can change the world!